With Christmas on the way, it’s always a good time to have fun in the kitchen, instead of stressing out about dry turkeys and what the vegan is going to eat. I can say that as I don’t host Christmas, my lovely mum does, and she is gonna be stressing out big time this year when most of her family come to visit; it’s gonna be the biggest Christmas ever!! So to help celebrate the launch of Cadbury’s new baking range, I thought I’d share some cute ideas for Christmas. Recipe found here. I didn’t actually sample these, but the feedback I got were they were good. I used a mini cupcake tin to make the tartlett cases which proved to be a lot of effort try to get the right shape to mould. I couldn’t find any mini marshmallows to save my life (okay I only looked in one store and gave up), so I used an apple corer to cut out smaller circles from regular sized marshmallows. It was a sticky job but did the trick just fine. Still, it was worth all the effort to see the look on peoples faces when you give them such a cute treat. Recipe found here. My first attempt at cake pops ended in quite a few four letter words being shouted. After this experience, I now know to make them smaller to prevent them sliding down the lolly pop sticks. I had three successful cakepops but the sun was down and I didn’t really want to photograph them in my lightbox. I did anyway just in case they weren’t going to make it through the night… I then when to put a prop behind them and they fell over…. amazingly they did make it through the night and I tried to photograph them again. A word of advice to anyone attempting cake pops… get a foam block, containters filled with rice do not do the same job! Recipe found here. As I recently blogged these, you know how much I like these, and I’m sure Santa will too 😉 Always add more chocolate than required!! 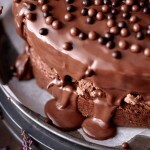 So when it comes to chocolate, the possibilites are endless. 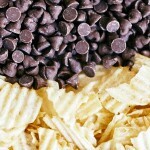 I’ll be using the dark chocolate baking chips in some Elvis granola I’ll be making soon, so stay tuned for that! Iron Chef Shellie sampled Cadbury chocolate thanks to The Online Circle. I love the Rudolph tarts they are too cute!!! OMG Rudolph tartlets are just so gorgeous! You make the cutest looking edible sweets ever!!! The cupcakes are so cute. Baking can be so frustrating sometimes when things go wrong. I’ve cursed a few times baking when things don’t rise, burn, don’t cook or just taste awful. Oh my god your rudolph tartlets are SO adorable!!!!! I love the photo of cookie monster with the chocolate chip cookies. He was my favourite Sesame Street character! !